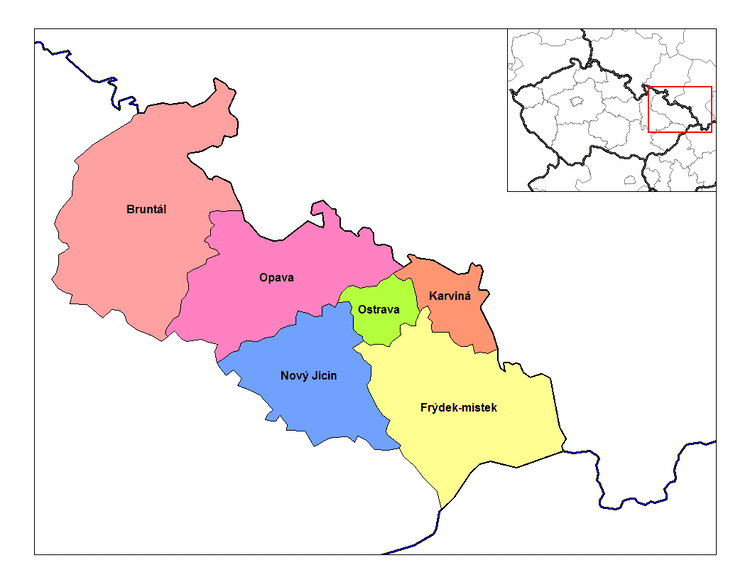 The South Moravian Region (Czech: ; Slovak: ) is an administrative unit () of the Czech Republic, located in the south-western part of its historical region of Moravia (an exception is Jobova Lhota which belongs to Bohemia). Its capital is Brno, the 2nd largest city in the Czech Republic. The region has 1,169,000 inhabitants (as of 30 June 2013) and the total area of 7,196.5 km². It is bordered by the South Bohemian Region (west), Vysocina Region (north-west), Pardubice Region (north), Olomouc Region (north east), Zlin Region (east), Slovakia (south east) and Austria (south). 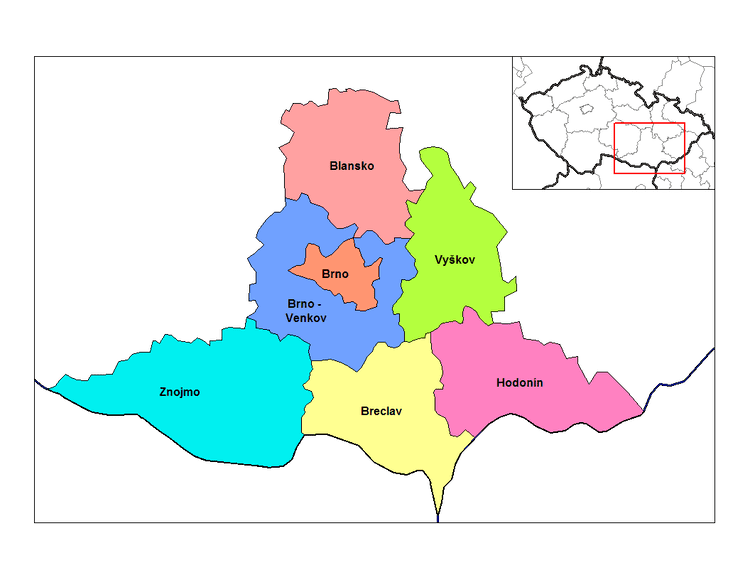 The South Moravian Region is divided into seven districts (Czech: okres): Blansko District, Brno-City District, Brno-Country District, Breclav District, Hodonin District, Vyskov District and Znojmo District. There are in total 673 municipalities in the district of which 49 have the status of towns. There are 21 municipalities with extended powers and 34 municipalities with a delegated municipal office. The region is famous for its wine production. The area around the towns of Mikulov, Znojmo, Velke Pavlovice along with the Slovacko region provide 94% of the Czech Republics vineyards. With the area of 7,196.5 km² the South Moravian Region is the fourth largest region of the Czech Republic. The highest point of the region is located in the eastern part of the region on Durda mountain (842 m). The point with the lowest elevation (150 m) is situated in Breclav District at the meeting of the rivers Morava and Dyje. The northern and north-western part of the region is covered by the Bohemian-Moravian Highlands (Czech: Ceskomoravska vrchovina) and the Moravian Karst. There is an extensive cave complex in the Moravian Karst with 138.5 m deep Macocha Gorge. In the eastern part the region reaches to Carpathian Mountains. The Bohemian-Moravian Highlands and the Carpathian Mountains are separated by the Lower-Moravian Valley (Czech: Dolnomoravsky uval). The southern part of the region is predominately flat and dominated by fields, meadows and the remainders of riparian forests. The largest river of the region is the Morava river. Other significant rivers are Dyje, Svratka(and its tributary Svitava), which are all tributaries of Morava river. The whole region belongs to the drainage basin of Danube and subsequently of the Black Sea. There is a number of landscape parks (Czech: chranena krajinna oblast) located across the region: White Carpathians Landscape Park, Moravian Karst Landscape Park and Palava Landscape Park. Moreover, Podyji National Park is situated in the south-eastern part of the region. The nominal gross domestic product of the South Moravian Region was 397.2 billion CZK in 2011, which is 10.3% of the national GDP. Among other regions, South Moravian Region had the third largest share on the national GDP. The GDP per capita was 341,00 CZK in the same period, which is 93.6% of the national average.